Adobe up until now has made available a version of Flash Player for the Android mobile operating system. Back in February, Adobe pushed out a notification that it stopped developing Flash for Android devices, and that Chrome for Android Beta would not support Flash contents because of this while the default Android browser would for some time to come. Yesterday Adobe posted an update on Flash Player and Android, effectively announcing the end of Flash on the platform. According to the post, there are two types of Android devices running Flash currently. First certified devices which usually include a pre-loaded version of Flash Player or have integrated the technology as part of a system update, and uncertified devices where users actively downloaded Flash Player from Google Store to install it on their Android devices. Starting with Android 4.1, there won't be any certified implementations of Flash Player on Android anymore, which basically means that Adobe won't cooperate with manufacturers to include Flash on their Android devices. For uncertified devices, Flash Support will chuck along, but new Flash installations will not be available anymore come August 15. It looks as if Adobe will remove the option to install Flash Player on Google Play at that day for new devices that do not have Flash installed yet. Adobe will however push out updates to existing users of Flash via the store. Android users running uncertified Android 4.0 or earlier devices have until August 15 to install Flash Player on their device if they want to use the technology on their devices. Users who update their phone to Android 4.1 should note that Flash Player is not certified for the operating system, and that "Flash Player may exhibit unpredictable behavior", whatever that means. Adobe notes that future Flash updates on Android 4.1 or newer devices won't work, and that users should uninstall Flash Player on devices that have been updated to the latest operating system version. 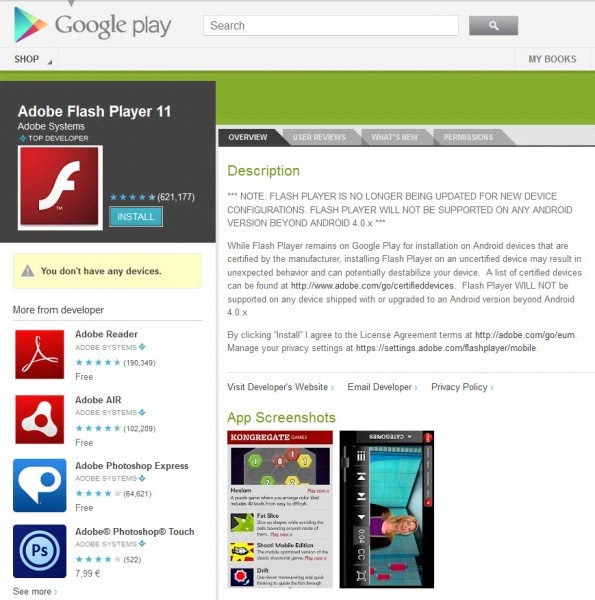 The Flash Player profile page on Google Play is notifying users about the change. The release of Android 4.1 marks the end of Flash Player for Android. Support will be continued for some time for pre-4.1 devices, but that will run out eventually as well, at which time Flash will be officially dead on the Android platform. Android users who really want Flash need to make sure to install it before August 15 at which point Adobe will block new installations for regular Android devices. Have you worked with Flash Player on Android? If so, what's your take on the move? This subject of Flash on Android is so confusing and I’m too backlogged to invest a lot of time researching it. With a Thunderbolt phone and Acer Iconia Tablet running ICS 4.0 this announcement is personally significant. Since so many web sites require Flash to navigate properly I don’t understand this point “Android users who really want Flash”. Nobody with any sense “really wants” that buggy piece of crap but without it web usage is severely hampered. I know because after going on line with the new Iconia within the first minute I was forced to d/l and install Flash for some trivial, ordinary site navigation. Maybe it was YouTube, don’t remember now. it is not logical that Google would leave all those users floundering, attempting to navigate Flash based web sites without a compatible Flash Player installed. No one but Adobe, and maybe Google, knows why the decision was made. Maybe it is because of the fragmentation and the increased testing, development and support that goes along with it? Any way of getting my android screen onto a monitor like appletv does Google nexus q allow that? Any way of getting my android screen onto a monitor like appletv does for iphone Google nexus q allow that? Flash didn’t work on my Galaxy Gio smartphone already because Adobe didn’t develop Flash player for ARMv6 CPUs. It was disappointing, but not critical, I’m able to use device and do with it what I want to do without Flash. The 2 things I wanted Flash on my phone for were Youtube and TED videos. Both are available via separate apps – Youtube app and TED app accordingly. Maybe Flash rising is over and we are going to see Flash decline. Open Web needs open standards, not the something that one big corporation can “develop or not develop”, but something open source which can be developed by anyone. Also, please note that Apple refused to pay Adobe for mobile Flash – and that didn’t stop widespread iPhone and iPad success. Firstly, the existing FLASH_11.apk and siblings will continue to work and I can guarantee you’ll still be able to get them after 15 August; just not from Google Play. Secondly, it’s long past time for Web devs to abandon Flash and move up to HTML 5. If your site relies on Flash, then you are a bad Web developer and you should feel bad.